You can’t operate a warehouse or manufacturing facility without good quality material handling equipment. Forklifts, pallet racks, ladders, docking equipment, levellers, ramps, and containers are the fundamentals if your employees are going to do a good job. They’re also vital if you want to serve your customers well. Why? Well-maintained equipment allows for the smooth flow of processes. This means that orders get processed quickly without delay and customers are happy. Word-of-mouth recommendations spread, and positive online reviews grow. Pretty soon, your business is growing and you may even look at expansion or developing an operation in a new location. It all starts with a foolproof business plan – and a key component of that is solid, operational equipment with minimal breakdowns. Investing in a warehousing or manufacturing business is extremely expensive. Maybe your business has grown over the years and your investment in material handling equipment has come from company profits. Alternatively, you may have started out from scratch with a loan or investors and decided to go big from day one. Either way, solid material handling equipment is central to your business. Many business owners look upon new equipment as cost-prohibitive, and decide to invest in used material handling equipment. There’s absolutely nothing wrong with buying used, as long as you do some research into the equipment you’re buying. Be sure to look into the dealership or supplier’s history. 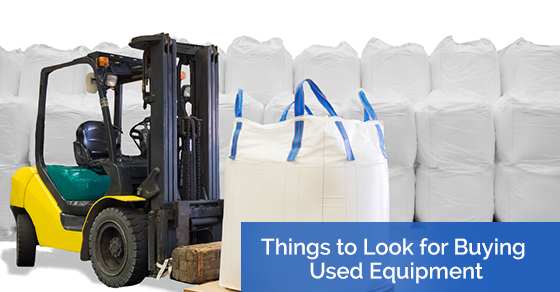 What should you look for when buying used material handling equipment? If you have a business plan and your business is growing according to your strategy, you’ll be able to anticipate business successfully. You’ll have a solid understanding of future growth expectations and where equipment needs are likely to arise. With a business case in place for new equipment, it’s time to explore buying. You can either hire a consultant to do this for your business or do the work yourself. There are pros and cons to each approach. A consultant may charge a fee or a percentage of each purchase. Consultants are usually well connected in the industry and know reputable suppliers. If any problems arise with the purchase, a good consultant will commit to resolving your difficulties. Doing the purchasing yourself may involve a steep learning curve to begin with, but you will acquire valuable knowledge going forward and make connections in the material handling equipment industry. Warehouses vary greatly, depending on business sector, and so the types of material handling equipment to support the operation of the warehouse vary, too. However, there are certain types of equipment that are essential to almost all warehouse operations. Let’s take a look at this type of equipment, and what you should be taking into account when you decide to buy used essential equipment. Forklift trucks are the top purchase when businesses are investing in used material handling equipment. They are an important part of all warehouse and manufacturing operations. They allow the business to quickly move and store materials, and get them onto pallets ready for new orders. The kind of forklift you buy will depend entirely on your operation. Electric forklifts perform well in indoor operations. They are reliable and sturdy, with a low centre of gravity. The electrics offer a good turning radius, produce less noise, and offer the best overall long-term cost savings. Electric forklifts don’t perform well in very cold or wet environments. They may not work as well in multi-shift operations and, of course, they won’t work at all if they are not plugged in for a recharge at the end of a shift. The initial outlay is more expensive, too. For this piece of used material handling equipment, you need to know about its age, past work environment, repair log, and battery use. Ask if it has been in any accidents. A diesel forklift is ideal for outdoor use and with a more powerful engine and, therefore, more torque. Indoor use does, however, require an expensive emissions system and proper ventilation. Finally, there is the propane forklift, which is good for indoor use. It’s unlikely that you’ll run out of fuel, as it’s just a question of replacing the propane tank. However, the tank will restrict rear view and a propane forklift may falter in cold temperatures. You should purchase from a national or international dealer, and a firm that has been in business for at least five years. That way, they will have developed a reputation and you can request references or look for testimonials online. Seek a warranty for your used equipment and ensure the company will honour it. Remain aware of every aspect of the transaction with the seller. You should expect good customer service and communication. This will help you assess what kind of service you will get after the transaction. Ultimately, you’ll want to build a relationship with a used material handling equipment dealership. There are a number of financing options but they are not unlimited. You may be able to get a low interest bank loan or negotiate a payment plan with the dealership. Alternatively, look for end-of-lease equipment or, for large operations, buy in bulk to save costs. Leasing is an option too. However, with leasing the equipment will be with you for a limited period of time. Don’t forget, sell off old machines or any unused equipment to raise funds for your purchase. With your new equipment in place, set up a preventative maintenance plan as soon as it is being used. It makes sense to protect your investment and try to prevent problems, instead of having to react when they arise. Regularly inspect equipment and perform maintenance tasks. Taking care of your used material handling equipment means reduced downtime which results in optimal processing of orders. Safety is a definite gain too – fewer accidents occur with well-maintained equipment. Saving money is likely too, as operating costs are lower with regularly maintained equipment. In the market for used material handling equipment? Michaels Global Trading has an impressive range of equipment, including forklifts, pallet racks, and packaging equipment. Call us today at 647-821-9961 or contact us here to discuss your needs.